When builder Marty McClelland found a little joey alive and well in the pouch of its dead mother, who had been hit by a car, he would never have thought that a few months later he’d have another mate to go swimming and mud-crabbing with. But that’s exactly what happened. Marty took three month old Solo – so named because when he was found he was completely alone in the world – to the vet and was given advice on a good formula to feed the little one, who weighed just over a kilo. A stroke of genius on Marty’s part meant that Solo still had a pouch to climb into when he was tired; a woolen jumper tied around Marty’s chest. Locals grew used to seeing Marty and Solo around town, even at the pub. At night he hung the ‘pouch’ up in the shed, and Solo slept happily through the night. During the days, when he wasn’t watching Marty work from the pouch, Solo would hop around behind with Marty’s dog. And this is where he seemed to get the idea that he, in fact, was also a dog. He joined them for mud-crabbing and swimming adventures. He went everywhere they went. Some locals in the Ningaloo region take kangaroos for pets, but Marty didn’t want to tame Solo. He was rapt one morning to discover that Solo had made cutting the cord a lot easier by doing what most young boys do as they grow into men; he hadn’t come home from the night before. Solo can still be seen around the Ningaloo region. For pointers on what to look out for – unlike some of the red kangaroos in Coral Bay, he’s fluffy and dark grey, and at last measurement, about three feet high – speak to the friendly, roo loving staff at the Ningaloo Reef Resort. They know Solo well, and might just introduce you to some other locals, like Freckles. Australia is a powerful nation in world swimming, and the tradition is alive and well among our marsupial friends. Wombats, wallabies and even echidnas are better swimmers than you might think. But not just at dog paddle. Echidna’s use their snouts as a snorkel, and Gary Sutton, a senior park ranger from Narawntapu National Park in Tasmania recently reported to Radio National’s A Walk in the Park program a sighting of “a wombat body surfing”. Sutton believes marsupials take to the waves not just for the thrill of carving up a barrel, but also to rid themselves of parasites, like lice and ticks that live on the skin. If you think there’s something funny about the picture you’d be right. 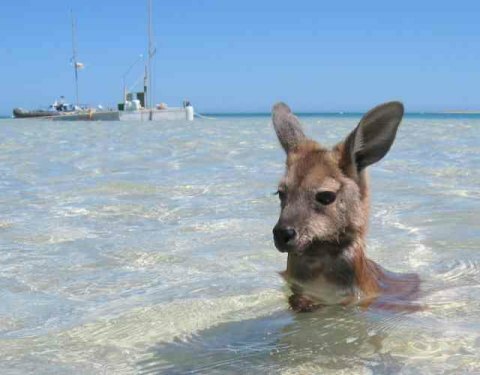 Kangaroos don’t usually swim. They can, and they’re actually quite good at it, using their powerful back legs in a dog paddle style. It’s an interesting quirk of a kangaroo’s biology that it can only use its legs independently when swimming. But they generally only take to the water when they’ve been chased into it.